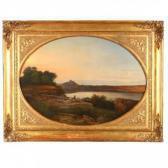 Find artworks, auction results, sale prices and pictures of Consalvo Carelli at auctions worldwide. Consalvo Carelli (1818-1900), View of the Vesuvius, Oil,19th C.
In this evocative landscape painting Carelli focused on the representation of the natural forces that are expressed by the gathering dark clouds and lashing sea that cause the ships to stagger. Condition: The painting is in good condition. Scattered small retouching visible under UV. On the left outer edge small loss of material caused by the framing, otherwise overall of very good impression. Consalvo Carelli (1818-1900) Consalvo Carelli was born in Arenella near Naples in 1818. 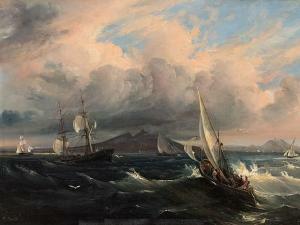 He received his artistic training by his father and the painter William Leighton. 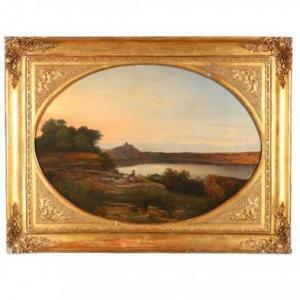 In 1830 he made his debut on the Espositione di Belle Arti in Naples and became a member of the artist group Posilippo, who studied the landscape from nature. Travels took him to Rome and Paris, where he studied the paintings of the French Academy artists linking his work to the classical ruin landscapes of the 17th century. In addition, he worked for the royal court in Versailles and later at the royal court of Margherita de Savoyen. He received numerous commissions from the aristocracy and worked for the Russian Tsar. 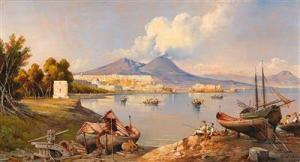 In 1855 he returned to Naples and became a member of the Accademia di San Luca in 1874.